Referring to many parts, things, or people of multitudes of different kinds; having several aspects: Some multifarious leaves are arranged in numerous vertical rows. 1. Conveying an utterly immoral or wicked behavior that is vile and atrocious: The two brothers were developing a nefarious scheme to cheat elderly people out of their money. 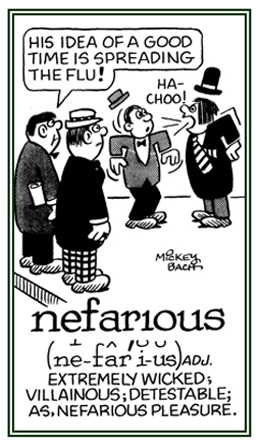 2.Characteristic of someone who or an activity that is extremely villainous, iniquitous, and heinous: A nefarious deed is an extremely wicked one which violates the laws of God and humans. The nefarious acts of some terrorist groups; such as, showing the beheading of their captives, are outrageously wrong and should inspire the rest of the world to destroy such groups. 3. 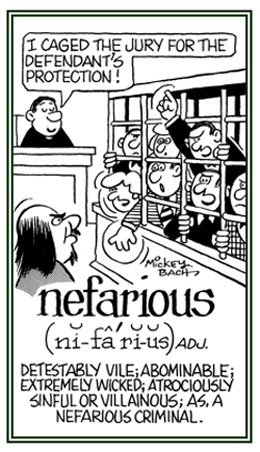 Etymology: from Latin nefarius, "impious, abominable"; from nefas, "wrong, sin, crime"; formed from ne-, "not" ("against") + fas, "divine law" + -ous, "having much, full of, abounding in". © ALL rights are reserved. Referring to something that is eight sided or formed by that number. Of all varieties, forms, or kinds: Henry experienced omnifarious emotions, from joy to anger and to frustration. Relating to many kinds or fashions. A reference to something that is turned in seven different ways or directions. Cross references of word families related directly, or indirectly, to: "talk, speak, speech; words, language; tongue, etc. ": cit-; clam-; dic-; fa-; glosso-; glotto-; lalo-; linguo-; locu-; logo-; loqu-; mythico-; -ology; ora-; -phasia; -phemia; phon-; phras-; Quotes: Language,Part 1; Quotes: Language, Part 2; Quotes: Language, Part 3; serm-; tongue; voc-.